Pool water loss to evaporation might not seem like a big deal. But it is. And it’s expensive. Do you want to stop it? Read on…. Most of us learned about evaporation at school. It’s the natural process whereby water molecules escape from the Earth’s surface and enter into the atmosphere. No big deal. Except, what they didn’t teach us at school was it’s a natural process that can be expensive – and it’s not just the cost of the water we’re talking about here! 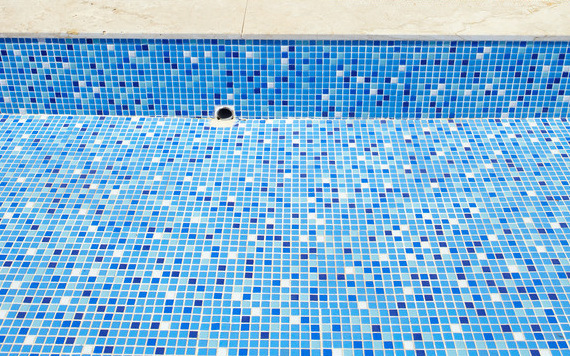 The reason it’s expensive is because evaporation doesn’t just remove water from your pool, thereby requiring you constantly to be topping up the water level, and running up your water bill in the process; there’s a triple-whammy that it removes heat and chemicals from your pool – accounting for 70% of pool heat loss and about the same in chemicals. So, if you have a heated pool – even a solar heated pool – up go your running costs. So, when the natural process of evaporation suddenly leaps out of the classroom and into your backyard (and into your wallet! ), it’s worth taking steps to see what you can do to prevent it. How Much Can My Pool Evaporate? The following table shows the evaporation rate expressed in liters per hour of an unoccupied standard 8 x 4 meter pool at given water temperatures, air temperatures, and percentages of humidity. *Humidity rates are about what you’d expect in Sydney, Melbourne, Brisbane. Often humidity can be 70% in these areas too. What this means in practice is that, averaged over the 6 hottest months of the year, your pool is likely to evaporate at a total water loss of around 10,500 litres. A standard 8 x 4 metre pool only holds slightly more than 41,000 litres. So, you’re losing around a quarter or 25% of your entire pool water to evaporation every swimming season. What Causes Swimming Pool Evaporation? Pool water evaporation and, more importantly, the rate of pool water evaporation is caused and influenced by a number of different factors. 1. The pool surface area. Basically, the larger the pool surface area, the greater the volume of water that will be evaporated. Specifically, the water temperature on the surface: i.e. at the point where the water meets the air. This one requires a little explanation. It’s not simply the case that hotter air temperatures result in greater evaporation. The specific issue is the difference between the air temperature and the water temperature: the greater the difference, the greater the rate of evaporation. As a result, most evaporation actually occurs at night. This might seem counter-intuitive, but the reason is that at night the pool water is relatively warm, but the air temperature has dropped. Therefore, the difference between the air and water temperatures is greater – thus, more evaporation occurs. During the middle of the day, however, the air and water temperatures are often fairly close – thus the rate of evaporation is less. Humid air already contains a lot of moisture. As a result, its ability to absorb more is limited. The practical upshot in terms of losing your pool water is this: when the air’s humid, the evaporation rate is slower; when the air’s dry, evaporation rate is greater. The windier it is, the faster the rate of evaporation. The reason for this is that the air just above the surface of the water is the first responder to evaporation, and it has its own little micro-climate, with its own little micro-humidity. Just as with the humidity of the atmosphere as a whole, the humidity of the few centimeters of air immediately above the surface of the water dictates the rate of evaporation. When its micro-climate becomes saturated with water it acts like an insulating layer of moist and warm air, and the evaporation rate naturally slows. And that’s where wind comes in. Even a small amount of wind will constantly displace this insulating layer of air. The result? Yup, increased evaporation. In fact a gentle breeze of no more than 10 km per hour will increase the rate of evaporation by more than double. The rate of evaporation increases when people are in and using the pool. And the more people who are in the pool, the greater the rate of evaporation. Why? Because human activity has the same destabilising effect on the micro-climate of the few centimeters of air above the water surface as wind. How Can I Prevent Evaporation? Probably impractical – unless you enjoy the prospect of dumping ice cubes into your pool all night. Even less realistic than 1, above. Fair enough, this one is at least realistic. Planting hedges and shrubs around the pool can cut down the amount of air movement blowing across your pool. Likewise installing solid fences or similar windbreaks. Finally, a realistic, practical, and surefire solution. Pool covers reduce evaporation by up to 97%. That’s a big number. Put it this way, without a pool cover your pool is losing around 100 litres of water a day. 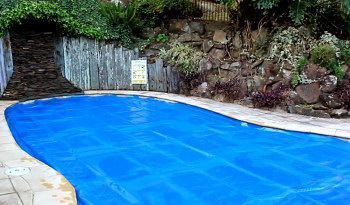 With a pool cover, the daily loss is only around 3 litres. Stop letting evaporation hurt your wallet. You may also check out our article “Do pool covers really stop evaporation?” for another discussion on swimming pool evaporation.